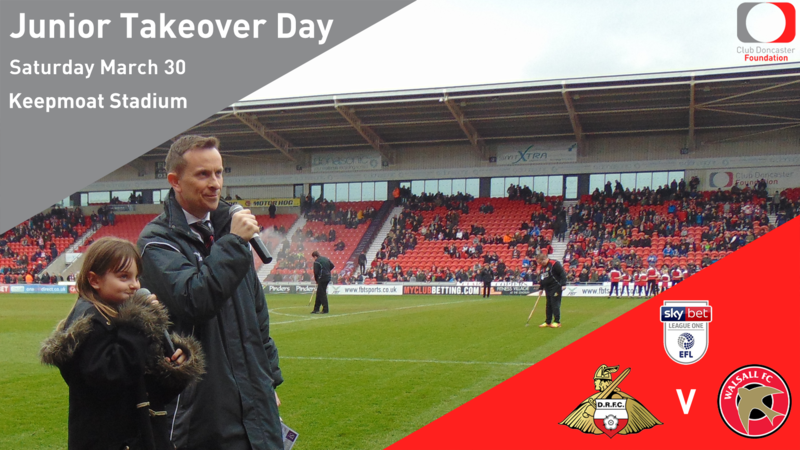 Join us on Saturday as our annual Junior Takeover Day sees young fans taking on all kinds of important matchday roles. Whether it is selling a programme, giving the team talk or announcing a goal - there is every chance that one of the 27 lucky youngsters will be doing the job. After recently winning the SkyBet League One Family Club of the Year, Rovers continue to uphold their reputation as a family club, which will be evident on Saturday as staff from all different departments of the club get involved in Junior Takeover Day. With each position, the children will assist that particular Doncaster Rovers staff member with their match day duties and will experience first-hand what goes on from behind the scenes at the Keepmoat Stadium. Club Doncaster Foundation’s sport development officer, Kelly Jackson-Powell, commented: “Junior Takeover Day is a fantastic opportunity for kids from our partner schools to experience the day-to-day running of the football club. Tickets are still available for the game, which will see Rovers look to maintain their play-off hopes when they face Walsall FC. You can get your ticket to join us by calling 01302 762576 or by going to tickets.clubdoncaster.co.uk.